They're cute and all, but it's time for them to go, says Mayor Sheila Fitzgerald. 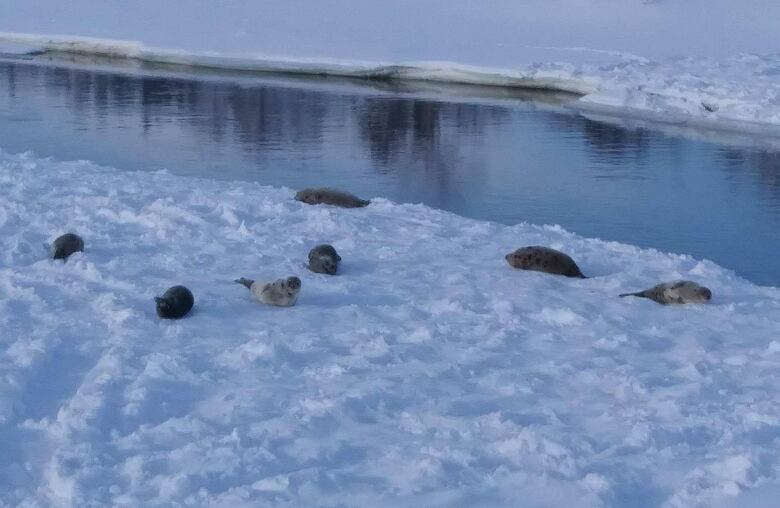 They're wide-eyed, whiskered and adorably fuzzy, but the seals swarming a northern Newfoundland town have officially worn out their welcome, according to the town's mayor. 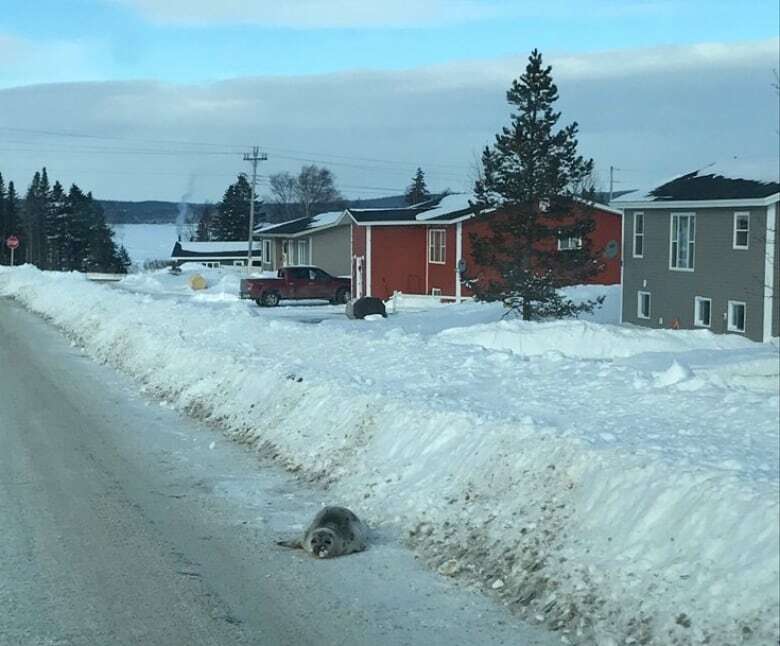 "I think a week's stay at the all-inclusive resort here in Roddickton-Bide Arm is long enough," said Sheila Fitzgerald. "It's time for them to move back to the wild and have a long winter, happily eating fish from the ocean." The flippered foragers first showed up in the town last weekend and have since been spotted on roads, at local businesses and even in backyards. At the end of this week, it was estimated that about 40 harp seals were in the town, stranded by a vast expanse of sea ice that made their trip back to the ocean a little too long. 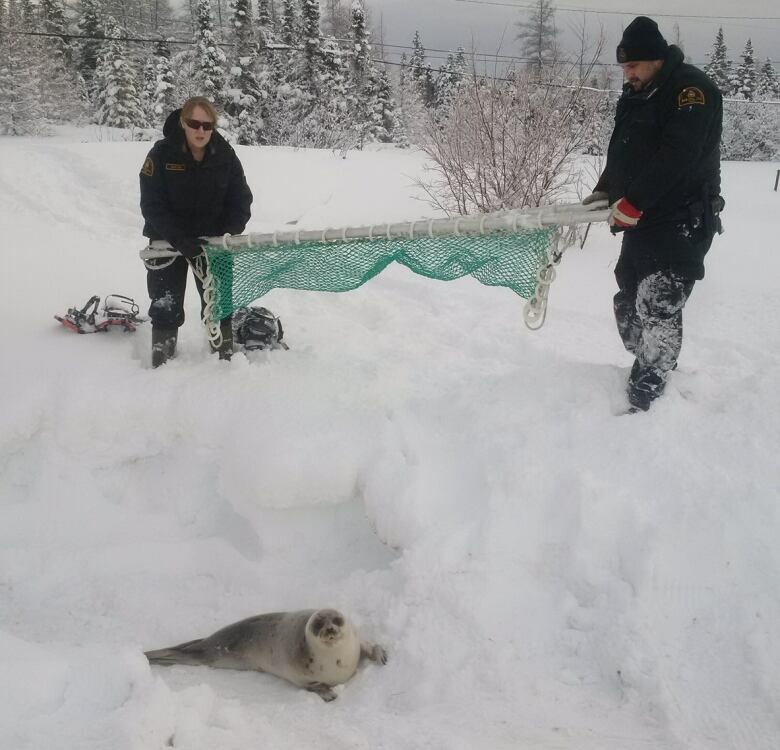 DFO officials arrived on Thursday to help out and, as of 8:30 p.m. Saturday, eight seals had been scooped up and taken to Englee. They were released into the water, Fitzgerald said. 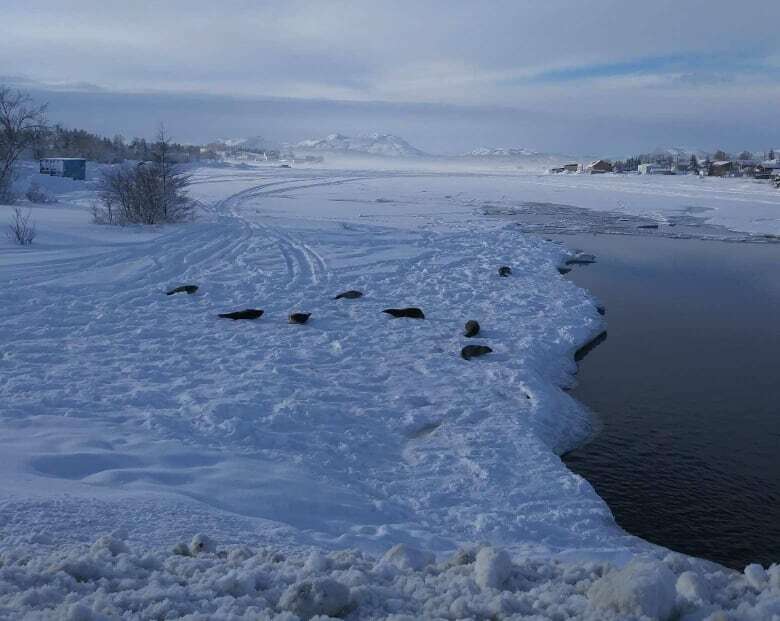 "Hopefully, by Monday, we can report that we are 40 seal residents fewer," she said, adding that it would be nice for residents to be able to let their dogs out without worrying there would be a large, hungry marine mammal waiting for them. Fitzgerald said there were signs they'd been "waddling" up by the town's watershed and that DFO is keeping an eye on it. A note posted to the town's Facebook page on Friday said extra chlorine had been added to the drinking water, just in case. The seal recovery team has so far been focusing on the seals in town because they're easy to get to, she said. "They're not going after the ones that are up in the woods behind the town." 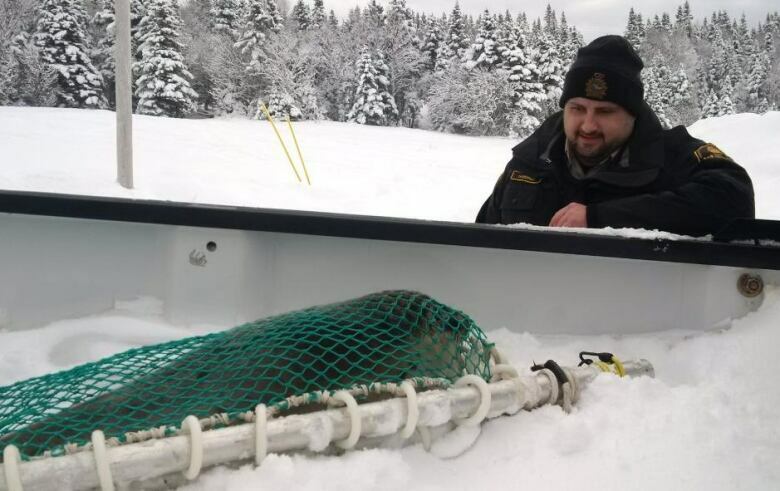 Using special nets with two poles on either end, DFO officials can scoop the seals. Those two poles are then tied together and, just like that, there's a netted seal ready for transport. 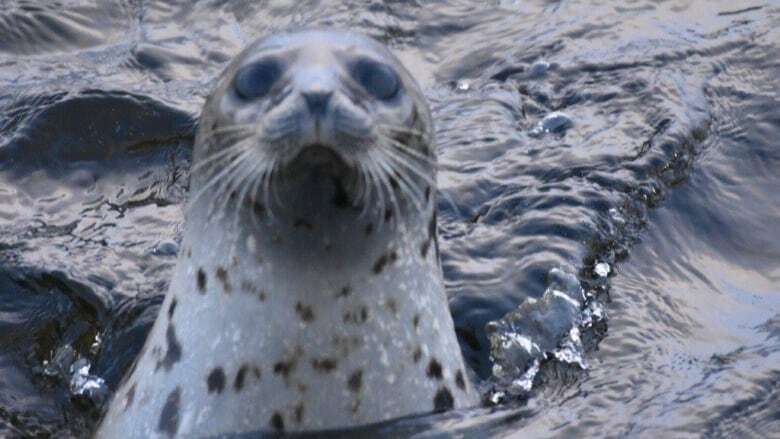 "These seals, they don't like it when people come close and they panic and they start to bark and hiss," Fitzgerald said. "I would say you'd have to probably be quick." The seals have have made headlines all over the world. Fitzgerald said she's done more than 20 interviews, fielding requests from Dublin to Australia. "There have actually been some requests from China, I just haven't responded yet." This is Fitzgerald's second term as mayor of the small town of about 1,000 people but her first tending to a seal invasion. "You're taking care of anything that comes up, but I never dreamed I'd be taking care of the seals, too."